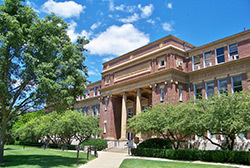 LVDA started work on the master plan for the historic Davenport Hall on the University of Illinois Urbana Champaign campus. The plan will guide the programmatic and design requirements for future building renovations to improve the learning environment for the College of Arts and Sciences. Our comprehensive analysis of the space will identify the most efficient options for building circulation, functionality, and space configuration and allocation. Conceptual designs with associated cost estimates and phasing implementations will address the upgrade of the building systems and infrastructure as well as sustainability goals.